At 14,179 feet, Mount Shasta is the second tallest mountain in the Cascade Mountain Range and the fifth tallest in California. This scenic drive heads towards Mount Shasta and through the rich volcanic past of the region, exploring Lava Beds National Monument and the geothermal powers of Lassen Volcanic National Park. Our scenic drive begins in Redding, straight on the I-5. While some of you may have a dislike for I-5, this section is rather beautiful as you will soon see. Before departing, consider at stop at Turtle Bay Exploration Park (A1). A combination of museum, science center, arboretum, zoo, walking trails and more; it offers something for everyone. The park is home to the Sundial Bridge, a pedestrian bridge that crosses the Sacramento River. Designed by world-renowned Spanish architect and engineer Santiago Calatrava, the cantilever spar cable-stayed pedestrian bridge is made of lightweight tube steel and the deck is primarily glass. Amazingly, the 217-foot tower is a working sundial and it is fascinating to watch as the shadow moves approximately one foot per minute. Walk part of the 16-mile Sacramento River Trail which also has access points at our next stop, Shasta Dam. Continuing north on I-5, visit Shasta Dam (A2). One of the largest concrete structures in the United States, it also provides one of the best views of Shasta Lake. To reach it, head west on CA-151 (exit 685) until Shasta Dam Boulevard. Have your camera in hand at the vista point for breathtaking views of Shasta Dam, Shasta Lake and the majestic snow-capped Mount Shasta. Take in the one hour free tour of the dam, learn more at the visitor center and picnic on the grassy meadows overlooking the lake. You can also walk across the dam. The lake itself is a water recreation paradise, offering water skiing, wakeboarding, fishing and boating. There are many beautiful short trails that follow the shoreline including Bailey Cove, Packers Bay and the longer 2-hour Clikapudi Trail. The Lake Shasta Caverns (H1), are a network of limestone caves with stalagmites, stalactites and crystals that glisten with unearthly beauty. To reach them, take exit 695 and head west on Shasta Cavern Road. The approximately two-hour tour begins with an informative ferry ride across the lake where a bus will meet you and take you to the caverns. Along the way you will be rewarded with fabulous views. Be prepared for the cool 50-degree temperature in the cave and be prepared to be awed by 250 million years of multi-hued geologic wonders. Continuing north on I-5 along the Sacramento River, the jagged peaks of Castle Crags State Park (H2) rise in the distance. These granite cliffs were formed by glaciers eroding the lighter rocks away during the last Ice Age. The spires soar 2,000-6,000 feet above the Sacramento River and some are accessible by hiking trails that offer outstanding views of the landscape. The park is also a great place for swimming, fishing, hiking and camping. Dominating the view is Mount Shasta, estimated to have the greatest volume of any stratovolcano within the Cascade Volcanic Arc. Mount Shasta stands tall as a spiritual significance for many people. It also creates an endless repertoire of outdoor activities. Explore its natural wonders by hiking, river rafting, boating, mountain biking and camping. Get even closer with a side trip. The 14-mile drive on Everitt Memorial Highway (A-10) takes you to the highest point you can drive on Mount Shasta. To get there, take exit 738, turn right onto Lake Street and right again onto Everitt Memorial Highway. A short walk from the top leads to the John Everitt Vista Point. Continuing north on I-5, you pass Black Butte (H4), a parasitic cone of Mount Shasta created around 9,000 years ago. If you would like to explore it with a hike to the top, take the dirt road off Everitt Memorial Highway which leads to the trailhead. 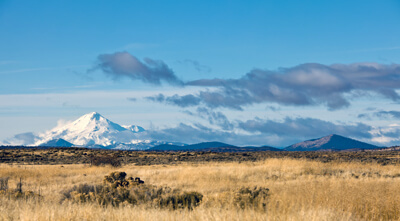 Breathtaking views of Mount Shasta, Mount Shastina, and on very clear days, Mount McLoughlin in Oregon await. After this, you arrive in the town of Weed where we take exit 747 for US-97. US-97 climbs into the Cascade Mountain Range and enters the spectacular Klamath National Forest where more species of conifers live than anywhere on the planet. Wild horses, pronghorn antelope, river otters, reptiles and amphibians are among the many animals that make this area home. Birders will find an astonishing diversity, each area of the forest featuring different species such as California towhee and blue-gray gnatcatchers in the oak woodlands and northern goshawks and olive-sided flycatchers in the deep coniferous forests. Many bald eagles can be found here as well. But all that almost pales in comparison to the glorious views of the surrounding mountain peaks. On the way up, you will pass the Living Memorial Sculpture Gardens (A3). Created by Vietnam veteran and sculptor Dennis Smith, the garden honors veterans with stylized metal sculptures and beautiful setting. The road is straddled between volcanoes and old lava flows, before entering the Butte Valley National Grasslands. Once a lake, this area is now preserved as wetlands, sagebrush flats, and farmland. The US-97 travels through Dorris, and just afterward, turn left onto State Line Road/CA-161 before entering Oregon. As the road name suggests, it skirts the border for several miles until reaching Lower Klamath Lake, part of the Lower Klamath National Wildlife Refuge (H5) which spans into Oregon (along our Volcanic Legacy Scenic Byway) and south along the US-395. The Lower Klamath National Wildlife Refuge is the first waterfowl refuge, established in 1908 by Theodore Roosevelt and one of the world’s best areas for watching Eagles and over 400 species of birds. Entering the Refuge requires a fee which is covered by the America the Beautiful Annual Pass. While our official drive continues straight to CA-139, you can cut through on Hill Road to the Tule Lake National Wildlife Refuge (A4) and Lava Beds National Monument, home to North America’s largest number of lava tube caves. More than 25 caves are open to the public. If you plan on exploring the caves, stop at the Visitor Center for information and to ensure you are prepared and for interactive displays of the area’s geology. Free guided tours are offered in summer. For those fascinated by Native American rock art, you will find the largest collection at Petroglyph Point than anywhere else in California. There is a fee to enter Lava Beds National Monument which makes the America the Beautiful Annual Pass a great value. Explore the interesting history and geology of the area with a hike to Mammoth Crater (H7) or on the 2-mile loop Big Nasty Trail (H14), a particularly rough region of the lava flows. This field was used by the Modoc Indians to avoid the US Army for several months. Continuing south on CA-139, you will see the high deserts of California and Nevada to the east and several locations where past volcanic activity is clearly evident. As the road climbs into the Cascades again, turn right on Lookout Hackamore Road. Just after the excellent bird watching area of Ash Creek Wildlife Area (H8), turn right onto CA-299. In a few miles, consider stopping at the Fort Crook Museum (M1) which consists a jail and blacksmith shop from the 1800s as well as pioneer and Native American artifacts. Shortly afterwards, you arrive at the CA-89 intersection. Heading north on CA-89 leads to Burney Falls (H9), a 129-foot waterfall often regarded as the most beautiful in California. The falls can be easily seen from the overlook or a 2.4-mile loop hike will take you up close. There are many more waterfalls in this region if you follow CA-89 north towards I-5. This scenic drive continues south on CA-89, where you will soon enter Lassen National Forest which surrounds Mount Lassen. The 2,000-foot Mount Lassen was created on the remnants of Mount Tehama which no longer remains. It is one of the largest lava domes on Earth and part of a chain of 18 large volcanic peaks stretching from British Columbia to northern California. Soon you arrive at the junction for CA-44, which this drive continues south on. Just after turning here, consider a stop at the Old Station Visitor Center (I2) for more information on exploring the area and hikes. One such trail is Subway Cave (H10) where you can walk through a 1-200 foot long lava-tube. Bring a flashlight. Continue south on CA-44 until the end and turn right onto CA-36 where in a few miles, you are greeted by Lake Almanor (W2). Sometimes called Little Lake Tahoe, Lake Almanor reflects the beautiful Lassen Peak and in summer makes an excellent swimming location. Moments after the lake, the road rejoins CA-89. Head north and in a few miles you enter Mount Lassen Volcanic National Park. Easily a whole day or more can be spent taking in the wonders. Every geothermic feature with the exception of geysers can be found here, including fumaroles, mud pots, boiling pools and terrain that emits super-heated steam. All four types of volcanoes are represented in the park including shield — Prospect Peak, plug dome — Lassen Peak, cinder cone — Cinder Cone and composite — Brokeoff Volcano. The park is a fascinating visit to the earth’s volatile past, present and future. After stopping at the Kohm Yah-mah-nee Visitor Center (I3), continue the drive on Main Park Road, climbing up towards Mount Lassen’s peak and opportunities to explore more geothermal powers. If you’re doing this drive in spring, please check road opening dates as they vary depending on snow conditions. Don’t miss Bumpass Hell (H12) which has the largest concentration of hydrothermal features in the park. The 3-mile round trip is easy but high altitude and rocky terrain is not for everyone. Sulphur Works (H11) is powered by the former Mount Tahama, whose remnants are seen in the distance as Brokeoff Mountain. Boiling mudpots and steam vents can be viewed from an easily accessible sidewalk. The road continues to climb, passing Summit Lake (W1) and stands of trees and meadows until Lassen Peak (H15), where a 2.5-mile trek up the rocky slopes brings you to the summit. Stop at the Devastated Area (V1) where you can observe the destruction caused by eruptions and mudflows in 1914-17 and how nature is repairing itself via a short interpretive trail. This stop also gives you another good view of Lassen Peak. Shortly after this, you pass Hot Rock which was carried by the lava in that same eruption. Further down the mountain, is Chaos Jumbles, a rocky slope that are remains of a landslide created by an eruption of the nearby volcano, Chaos Crags. Continue along to our next stop, Loomis Museum (M2) to learn more about the area’s volcanic past through exhibits and photographs. Nearby is the park headquarters, a perfect place to learn more about the area hikes. The serene beauty of Manzanita Lake is popular for fishing (catch and release only) or non-motorized boating. The 1.5-mile Manzanita Lake Trail is an easy, shaded hike along the shoreline offering a chance to see ducks, muskrat or beaver. Migratory birds can be spotted in the fall. After the visitor center, the road rejoins CA-44 and the scenic drive continues west towards Redding. From here, consider heading north into Oregon for more Volcanic Adventures along the Volcanic Legacy Scenic Byway or head south for the Feather River Scenic Byway.